Written by Dr. Vandana Patidar and medically reviewed by iCliniq medical review team. Stress is our body’s way of responding to any kind of demanding or threatful situation. In stress, certain hormones and chemicals get released in the blood which affects all the organs of our body. The heart beats faster and pumps more blood, the blood glucose levels increase, the whole body receives more blood and glucose, the brain vessels dilate and the person feels a throbbing headache, the lungs dilate and the person starts breathing faster and a feeling of suffocation occurs. My mom is under stress and crying a lot. Please help. Stress-a barrier for brain development,is that true? 1. Constructive stress (eustress): Stress is not always bad. Constructive stress can help you stay focused, energetic, and motivate you to do your best. It improves your concentration during a presentation, examinations, interviews or alerts you and makes you do best as per your abilities. 2. Destructive stress (distress): On the other hand, destructive or excessive stress can interfere with your productivity and performance, impact your physical, psychological and emotional health, and affect your relationships and career. Why Do We need to Manage Stress? Chronic stress has a negative impact on both the mind and body. It can lead to serious physical health problems like heart diseases, increased blood pressure, stroke, diabetes, migraine, gastric ulcers, and mental health issues like depression, anxiety, insomnia, overeating, sexual problems, irritability, increased smoking, and alcoholism, etc. So let us discuss some stress management techniques. Make time for regular exercise. One feels his/her mood elevate and gets good relief from stress after playing a good match, or running or jogging for some time. Any rhythmic movement such as walking, running, dancing, etc., should be done for at least 30 minutes a day. Physical activity increases certain chemicals and hormones in the blood and brain which helps lift our mood and combat stress. Socialization is very important for proper mental health. We, humans, are social animals and we need people around us with whom we can connect, share our feelings, and take support. Having good friends around you makes you happy and content. So, try to build good social contacts, do not indulge too much on the internet or invest time in making virtual friends online. Another quick way to relieve stress is by engaging one or more of your senses - sight, sound, taste, smell, touch, or movement. You could do some gardening, listen to sounds of flowing water from an indoor fountain, light aroma candles, take a warm bath, or dance to some peppy music. These are just some ideas, there is more you could try. When practiced regularly, these activities can reduce your everyday stress levels and boost feelings of joy and serenity. They also increase your ability to stay calm. Focus on eating small, frequent and healthy meals. Include lots of vegetables and fruits in your daily diet. Reduce sugar, sweets, and high-carbohydrate foods. Restrict alcohol on a regular basis. Decreasing sleep interferes with your daytime productivity, creativity, problem-solving skills, and ability to focus. Try to improve the quality of your sleep by going to bed and getting up at the same time every day. Try to sleep for eight hours at night. Turn off your phone, laptop, television, and other gadgets one hour before bedtime. The light emitted from these gadgets suppresses your body's production of melatonin and disturb your sleep. Avoid stimulating activity and stressful situations before bedtime. Instead, focus on quiet, soothing activities such as reading or listening to soft music while keeping the lights dim. Let us implement these techniques in day-to-day life and prevent the harmful effects of stress. 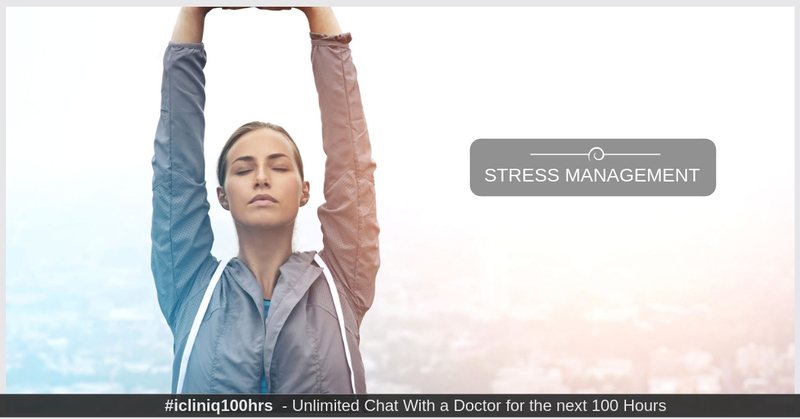 Do you have a question on Stress or Stress Management? Why is there a skin discoloration in my back? What changes have to be done to control BP?